It was a normal Wednesday afternoon/evening. I rushed dinner out, harped on my kids to eat it up, rushed to change the baby out of his dirty clothes from the day, and quickly packed the car to make it to soccer practice in time. I made sure that my son had packed his water, hounded my daughter to bring her toys to occupy herself, and jumped in the driver’s seat. As we traveled down the road, I noticed something that normally I wouldn’t have given a second thought. I was tensed up, and my shoulders were hunched up over the steering wheel. My mind raced with thoughts of my to-do list that was waiting for me sandwiched between after practice and bedtime. And I noticed it again, I was right against the steering wheel, my hands and shoulders clenched up in physical stress. Hmmmm. I didn’t feel stressed? But apparently my body was showing signs of otherwise. The author of Proverbs says that a CHEERFUL heart is good medicine. That means when our hearts are aligned with God-given joy, and we are happy, it can truly change our perspective and our physical stance. Our joy is the fruit of the Spirit dwelling inside of us. Having a cheerful heart, can bring life to not only our situation and the atmosphere, but also to our physical bodies. Back to the car scene. Then, I did something random. And out of character. I decided to pull over and tell the kids we need a reset. So instead of anymore talking, we are going to blast some music and sing along. At first, it was foreign. The kids just stared at me. Then, my daughter began to giggle at me. My son, began dabbing. And we all began to laugh. FUN. We were having FUN! And it was bringing peace and joy...right down to my bones. It’s not that I didn’t like fun. I like it! But I realized, that I had been so rushed from one thing to another, that I hadn’t even thought about it. One of the biggest hold ups I had for incorporating some fun was that, I had NO TIME for anything else on my plate. 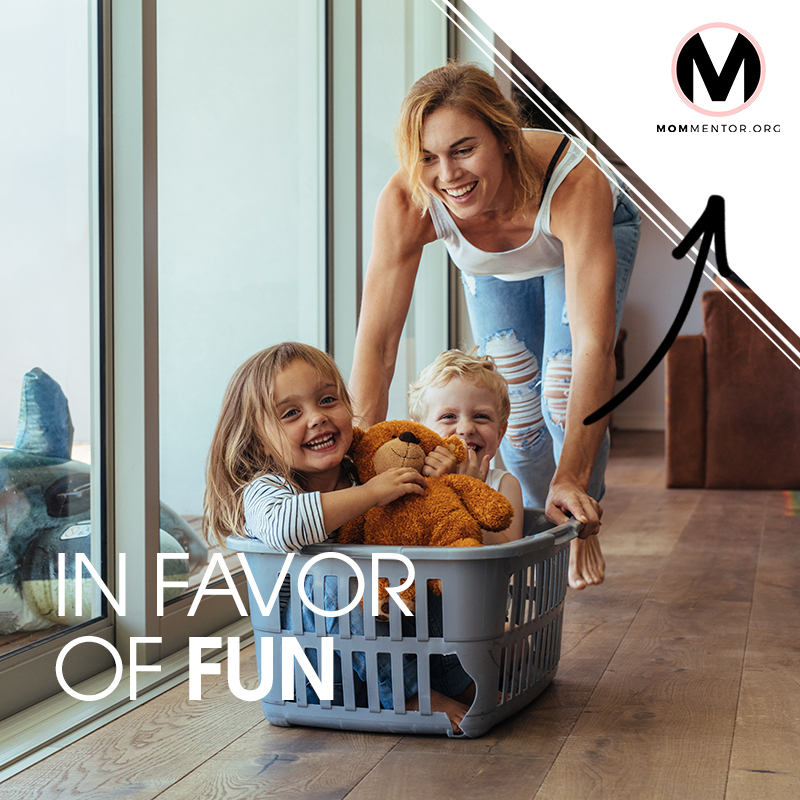 When I thought about adding fun things, I thought I needed to spend money, create a project that would yield a huge mess, or plan a whole afternoon adventure that would throw off our schedule. And while sometimes, it’s great to add extra fun things that do take time/resources, in most instances, I just needed to change my perspective of how to define fun. I’m all about the practical. And here are some things you can do to start the smiles today! 2. Stick a sticker to your face/put on a funny hat and act like you have no idea it’s there. 3. Buy your kids a small treat/gift and surprise them. How often do we actually say “yes” in the grocery store aisle line? NEVER. So once and awhile it’s fun to do and your kids won’t know what hit them. 4. MUSIC. Throw on fun music and dance…even if your kids don’t. They will think you’re crazy and at least laugh with you. Above all, hold tight to the verse, Phillippians 4:8. Fix your thoughts on what is lovely, pure, true, honorable, and admirable. In choosing to control the thoughts that you entertain, you allow yourself to focus on the things God wants you to. Despite the to-do list that grows by the minute, continue to thank Him for your blessings right here and now. Then, dare to enjoy them. This is not another article to place blame, Mama. This isn’t an article to tell you that your kids are looking at you and you should just be happy. No. This is a heartfelt pouring out, to tell you, I get it. Routine and the mundane pattern of us needing to take care of our responsibilities ARE, indeed, necessary. Dinner needs to be made, homework needs to be done, and the baby needs a bath/ BUT, can we have some simple fun with it? I think, we can. And I know that to enjoy our family, is God’s best for us. Sarah is a Florida girl living minutes from the ocean. She loves Jesus, local, delicious foodie joints, and embarking on little adventures with her crew. She is a wife to Sam, and a mommy to three awesome kiddos. She spends her days pouring into her church, sipping coffee, reading, jogging (she likes to think of it as running), and finding time to escape to the beach. She is honored to be a part of this life-giving community!Check her out on Instagram﻿ and Facebook! Sarah is a Florida girl living minutes from the ocean. She loves Jesus, local, delicious foodie joints, and embarking on little adventures with her crew. She is a wife to Sam, and a mommy to three awesome kiddos. She spends her days pouring into her church, sipping coffee, reading, jogging (she likes to think of it as running), and finding time to escape to the beach. She is honored to be a part of this life-giving community!Check her out on Instagramand Facebook!